I look forward to reading your whole blog and seeing future posts. 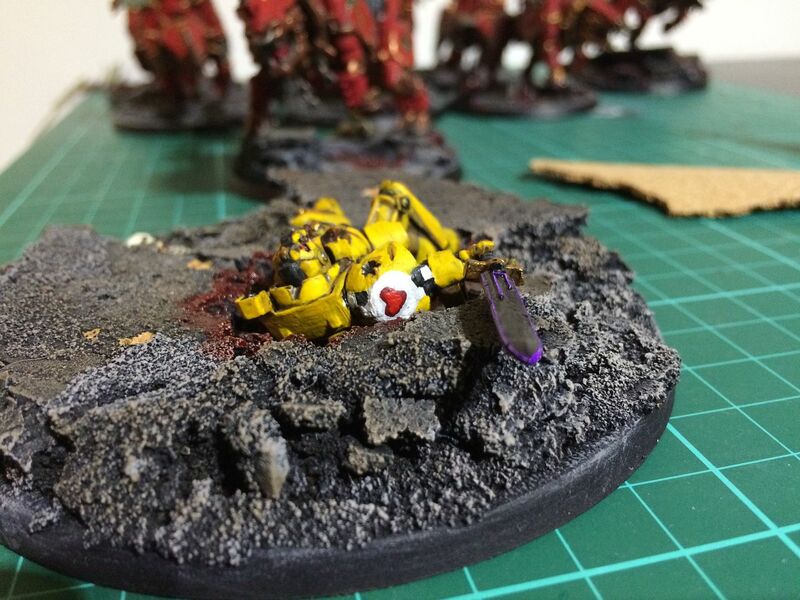 For The Greater Good - Desert Tau Painting Blog! 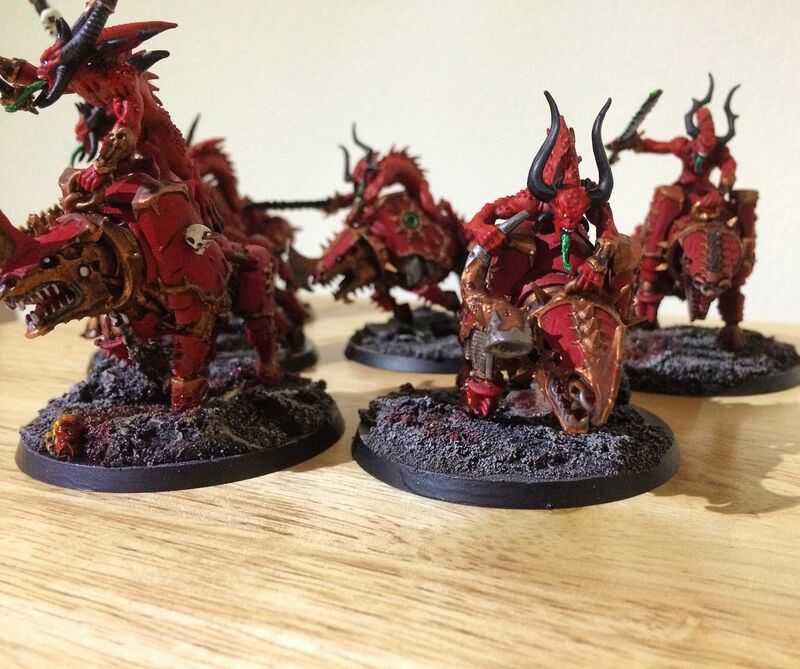 I really like that Abaddon counts as. Although I think I prefer the first posing. He seemed to be roaring out a challenge. 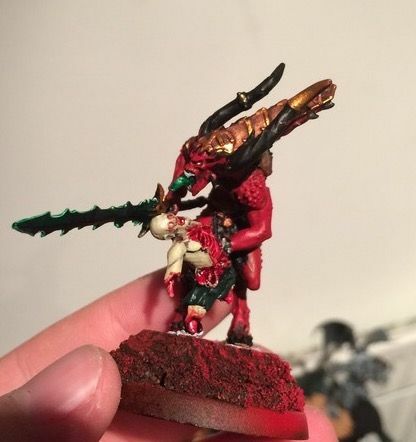 Bloodthirster helmet is really cool. Thanks buddy. I'm still undecided on the pose. 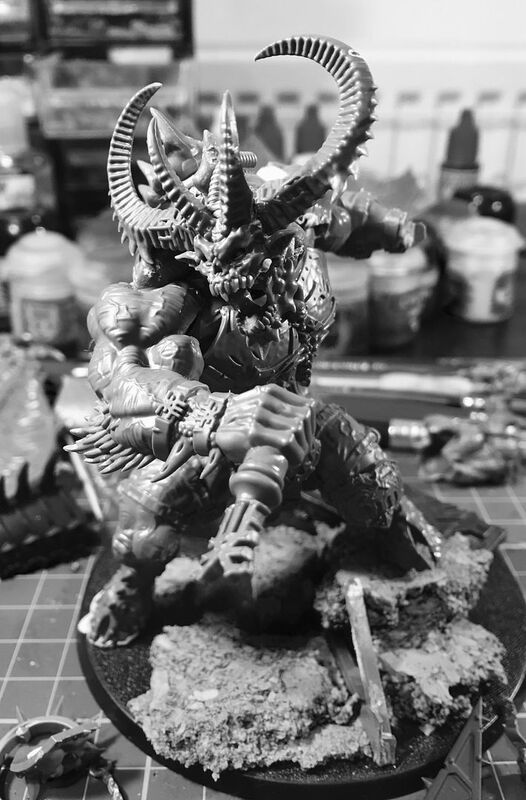 I have both options still to play with though and he'll no doubt change a few more times before he's painted. 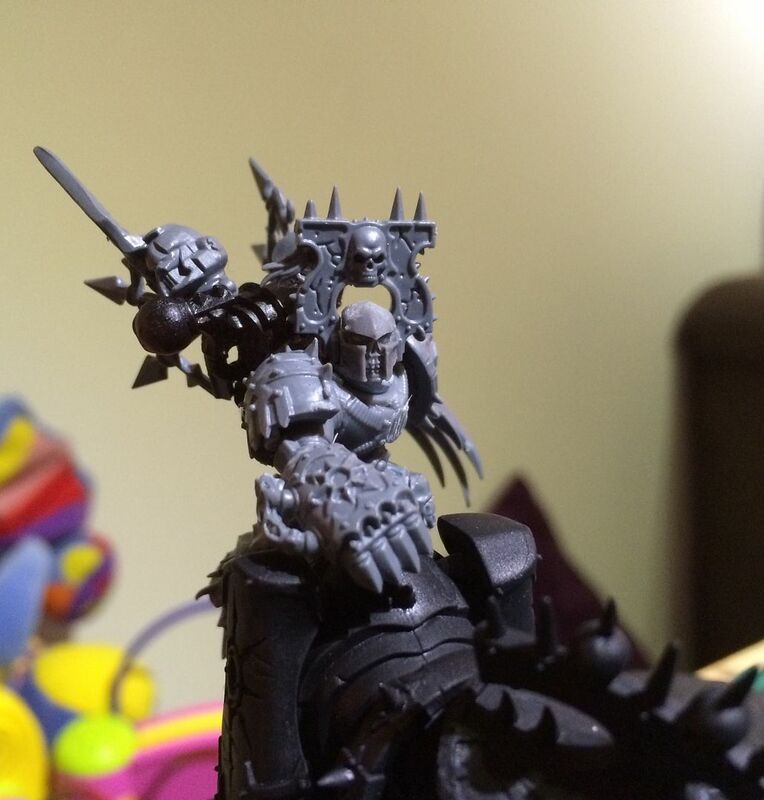 I think I've finally settled on a head for my Jugger Lord. 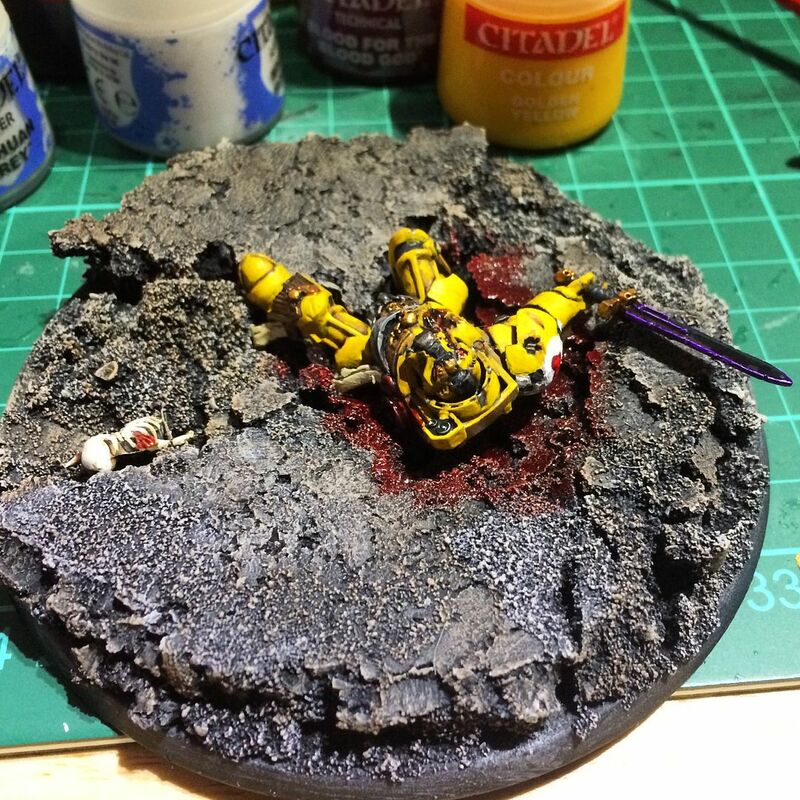 I know it's been done to death around here but I really like the base bit I used from the chappy. I messed around today with an idea for the trophy racks on his back. Including a DA head as I used this guy in a game yesterday and he took out a Company Mastwr and his assault squad in combat. Felt right to have a trophy to mark the occasion. please bear in mind that this whole model is still in early WIP stages. 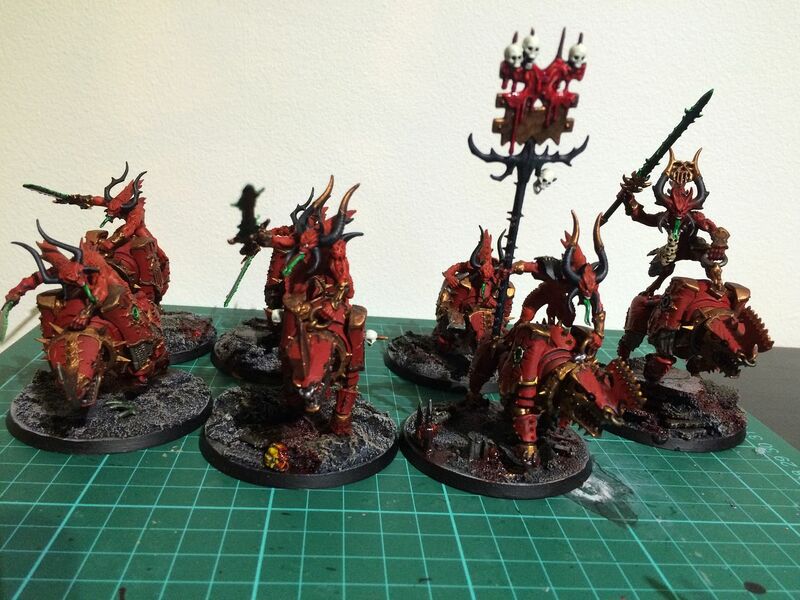 Not a massive update but hope to get on with painting the rest of the Bloodcrushers this evening. Or at least the Juggernauts. 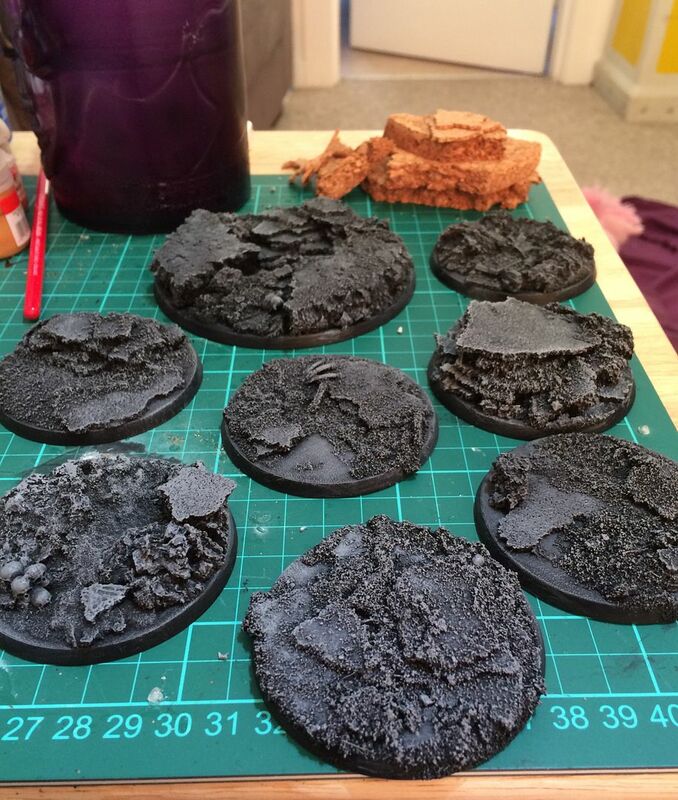 Just waiting on the washes drying just now. 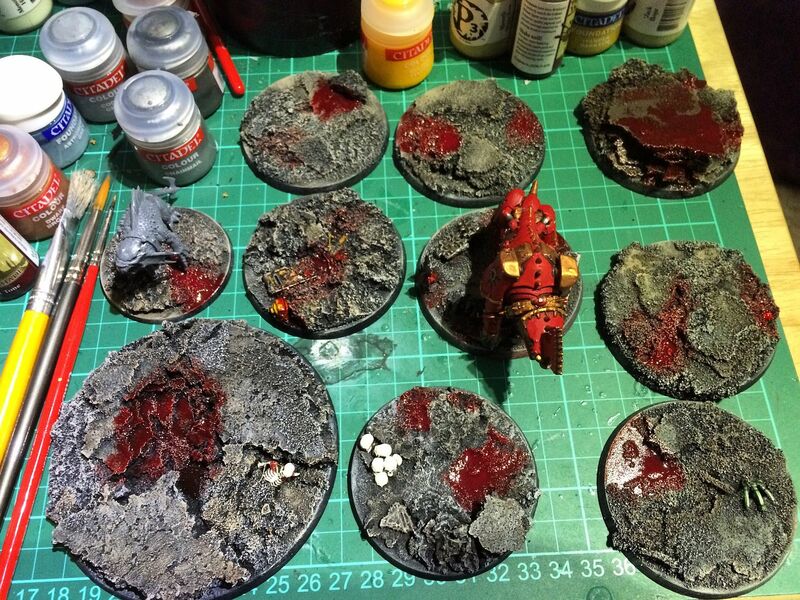 I still have to add casualties to two of the bases ie Jugger Lord and Skarbrand. They'll be painted separately though. Do I spy an acquired pedestrian crossing cone? That jugger lord is really well done. Great use of the Mino Chaplain head. @Medium of Death ha yes indeed you do. Acquired many years ago on a night out. Don't remember taking, just waking up with it in the living room!? Makes a great lamp. Thanks for the comment on the Jugger Lord. He still has a lot of work to be done yet though. 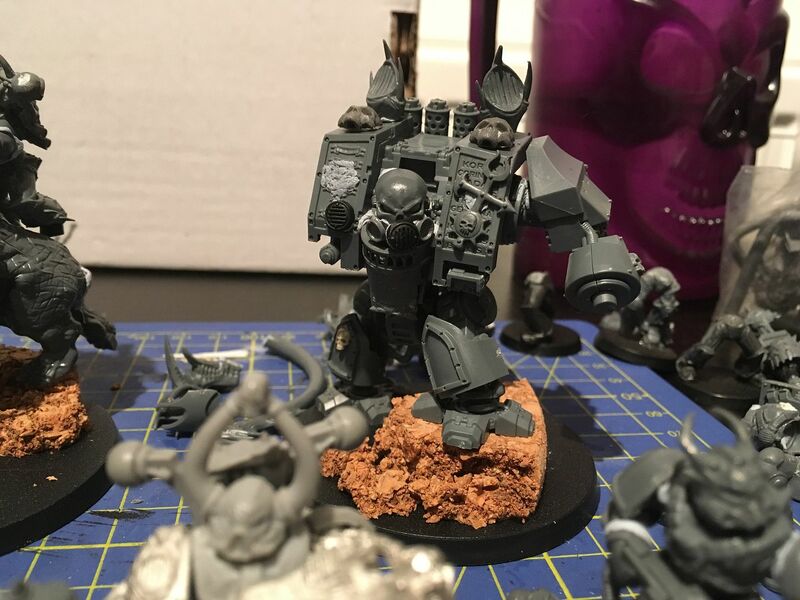 That new Juggernaut Lord looks great (as do all of your Juggernaut Lords tbh) As a matter of fact, how many of then do you plan on building?? Great use of both Enkomi's helmet (though being greek means i like the original very much already) and of the trophy racks on his bacpack. 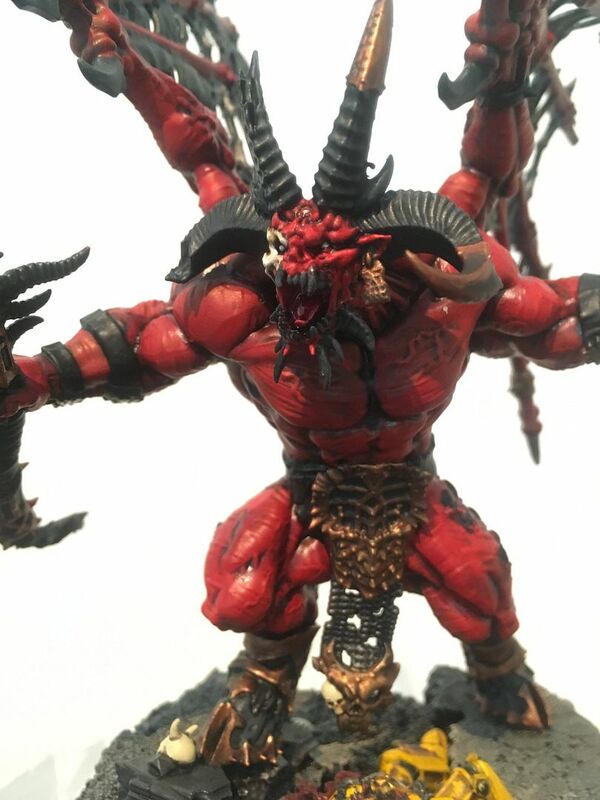 Lokking forward to see him (and any other minis) painted. Thanks buddy. 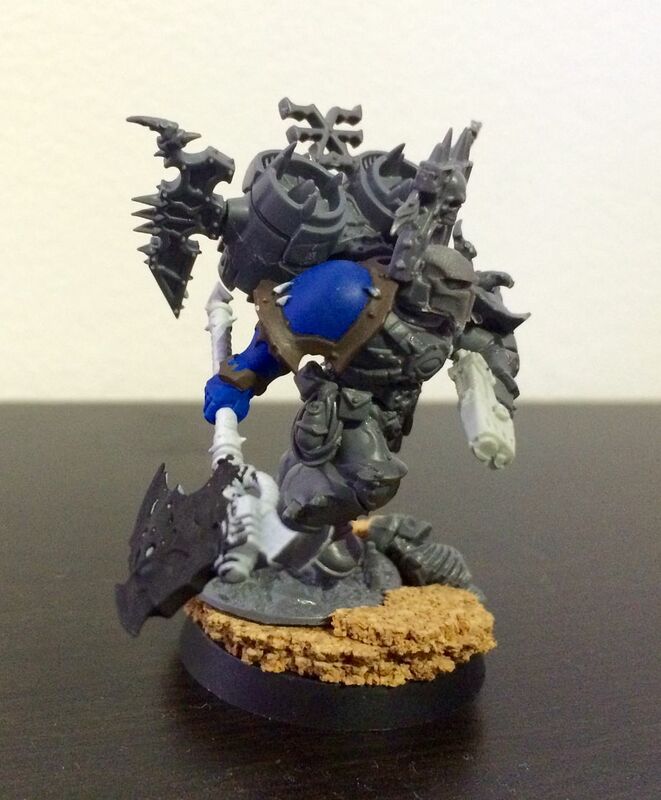 I plan to have at least 3 Jugger Lords, to use between my CSM and KDK armies. I have the original one I made a while back this new one with Fist/Claw and I'll make another with an Axe and not sure how else to arm him. 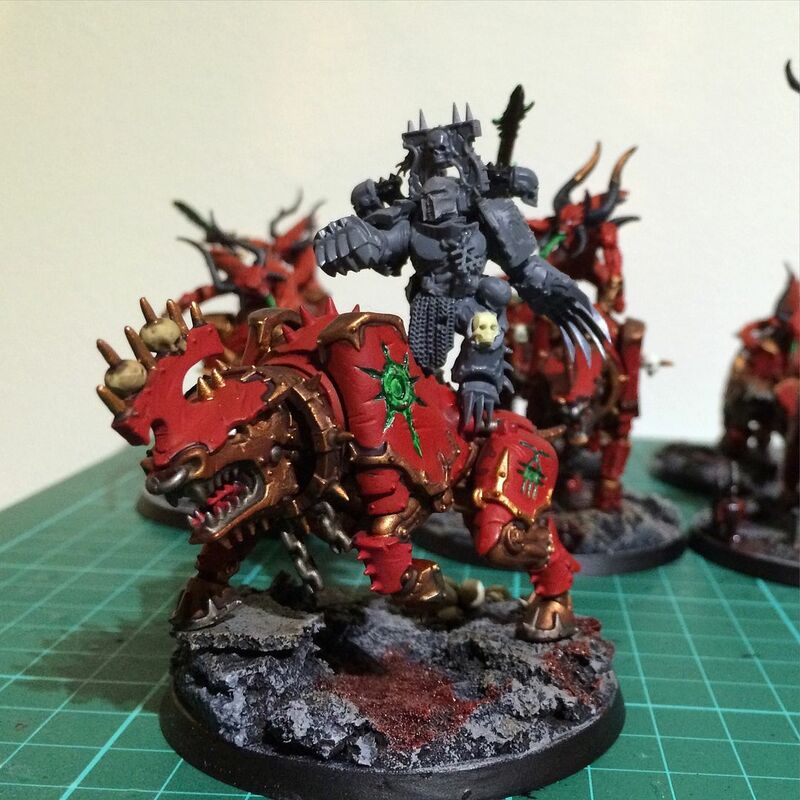 The Bloodcrusher riders have been worked on but not finished yet. Will get back to them very soon. Really needed a break from painting red today though. 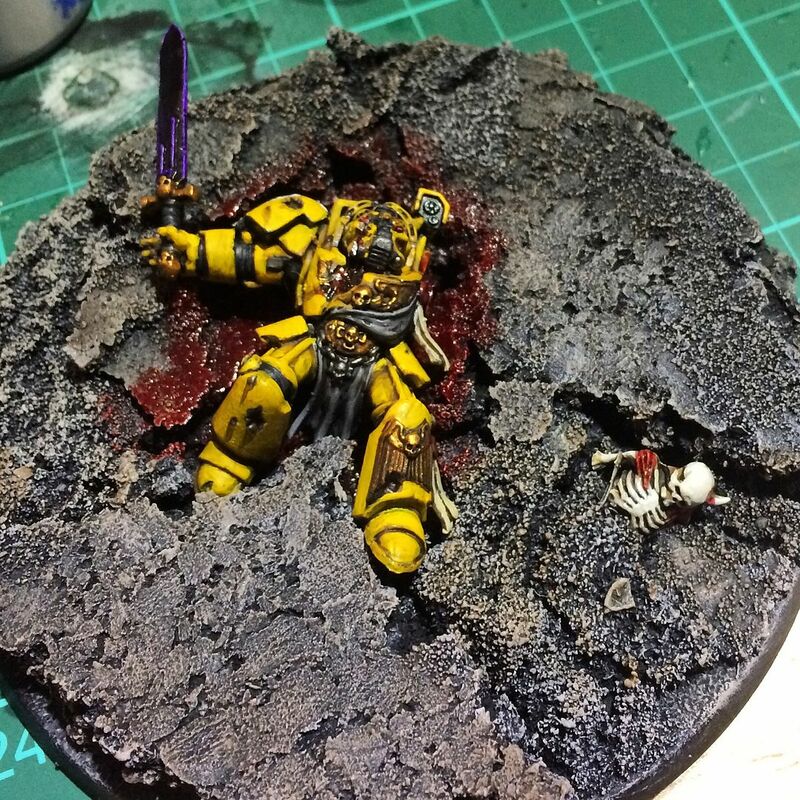 Took the chance to work on the dead terminator on Skarbrands base. 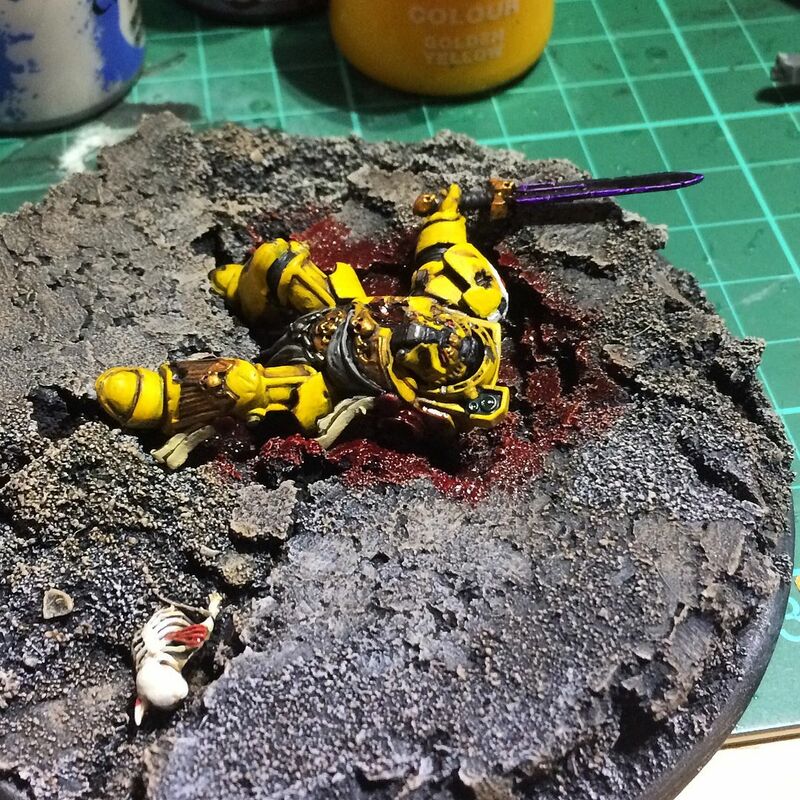 I've thought of starting a Lamenters force for a while. 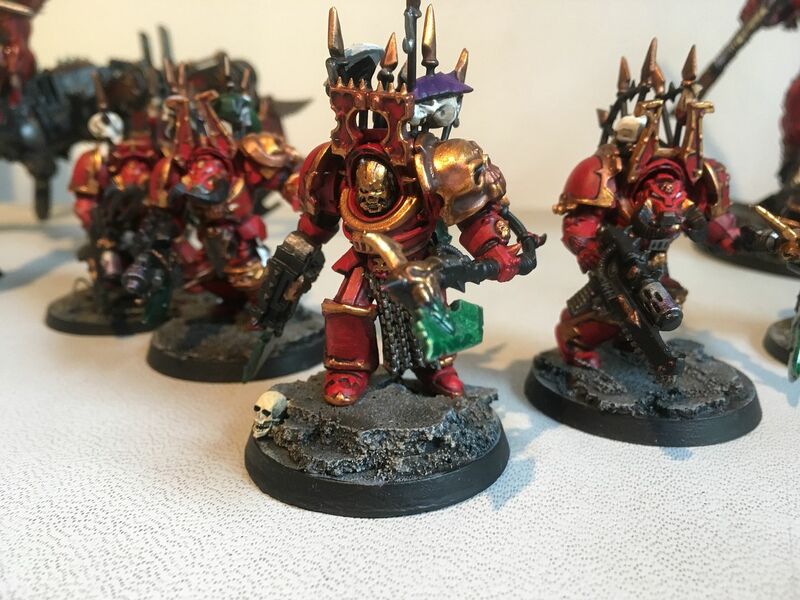 I love the Blood Angels fluff but wasn't keen on another red army so these guys fit the bill perfectly. Only problem is the chapter badge. 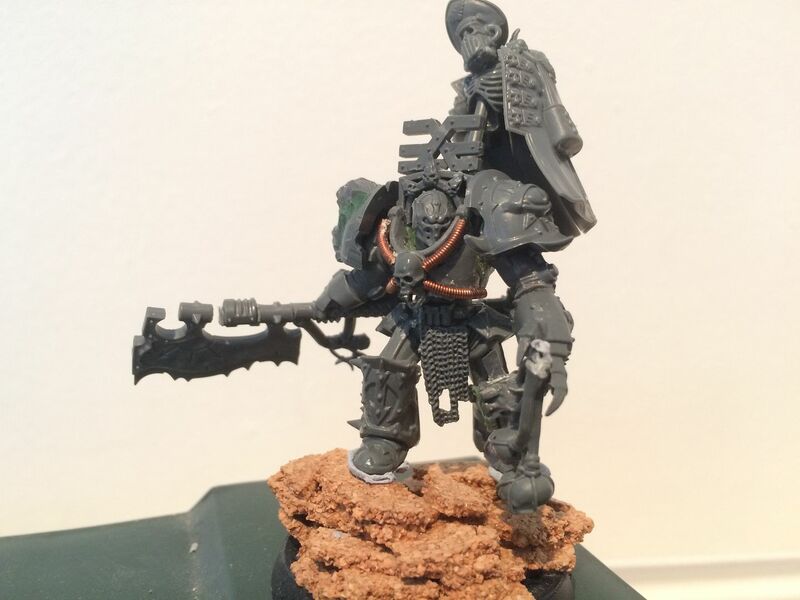 So used the dead guy as a test model. Had far too much fun painting him. Nice JuggaLord. Really like the pose and how he looks like he might jump off at something. 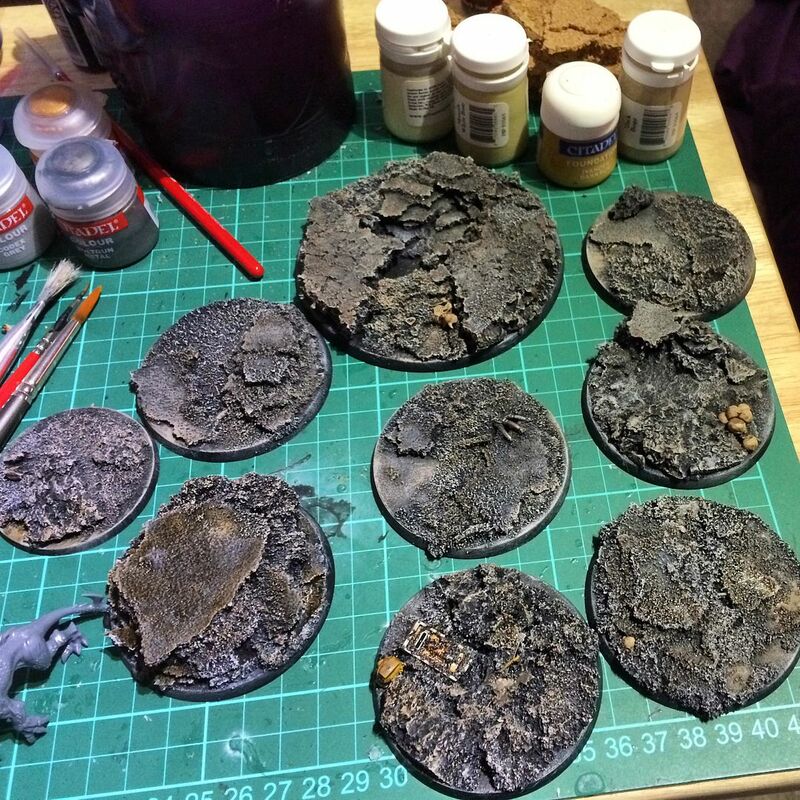 The bases are looking great too. Thanks buddy. 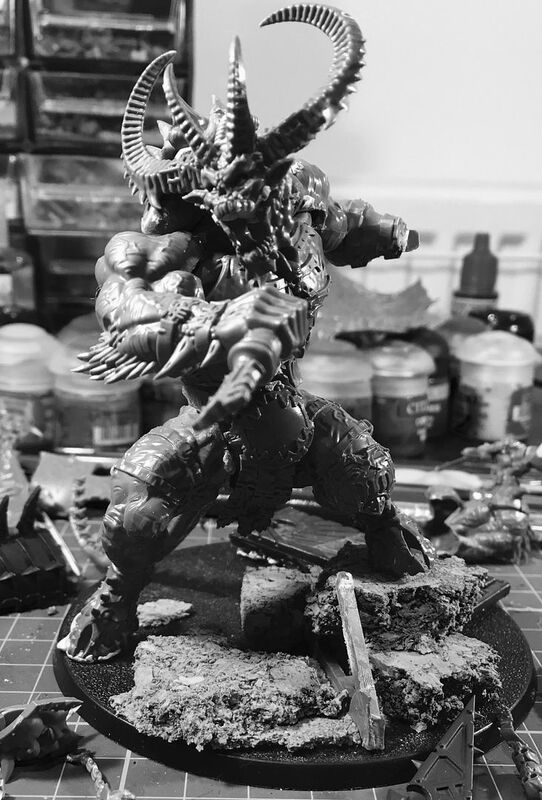 I'll be working on the Jugger Lord again ASAP. 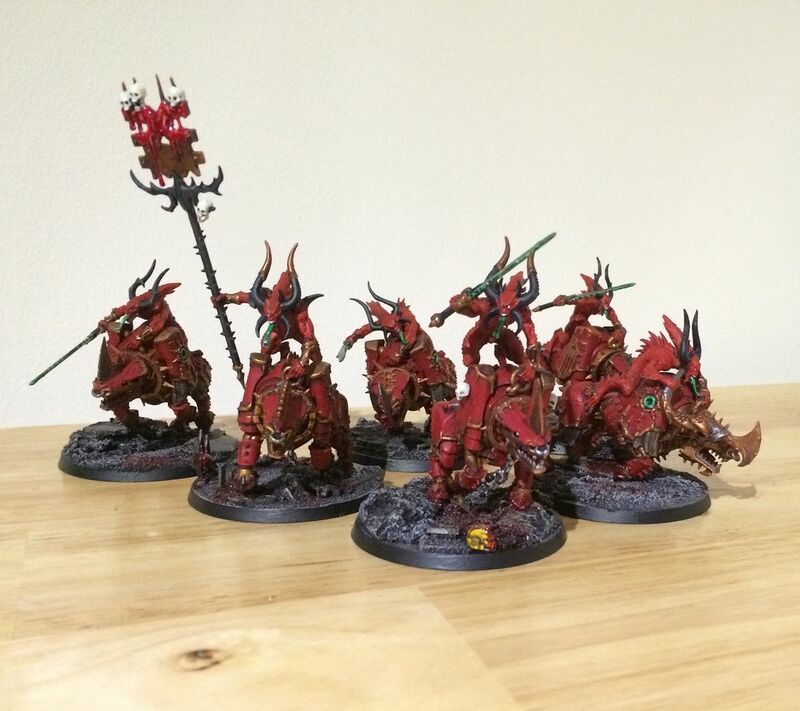 Finally got time to finish the Bloodcrushers, not my greatest work but happy with how they look as a unit. That's 2 out of my 8 vows complete. May need to extract a digit and get a move on. mmm... You know what would look awesome? A Khornate Brass Bull. 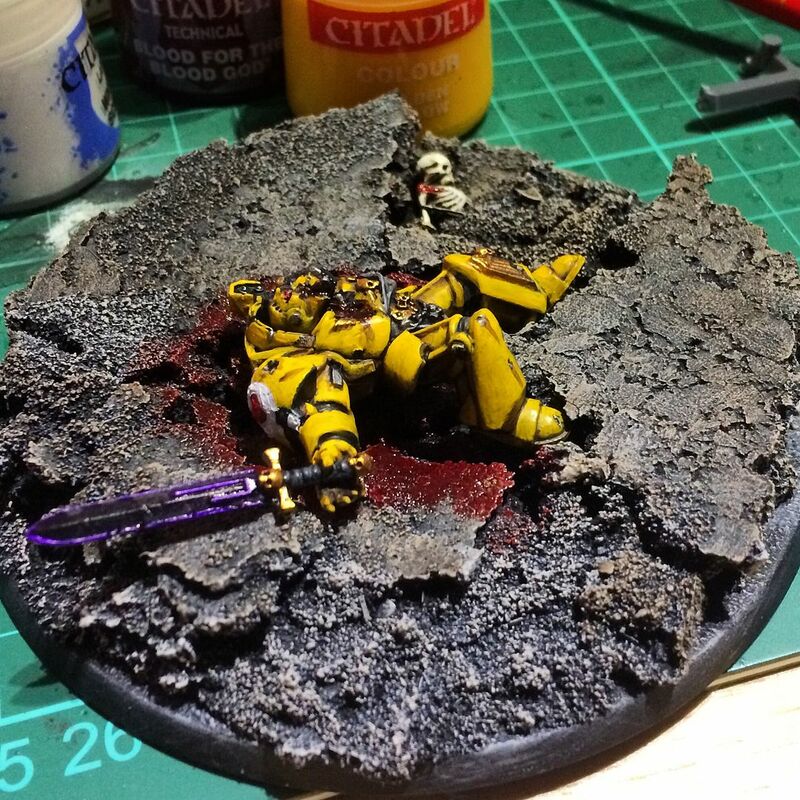 Forgot to put a pic of the actual chapter badge when I posted the last update of Skarbrands base so here it is. Also painted a Herald on Jugger using the herald from the Skull Cannon box. 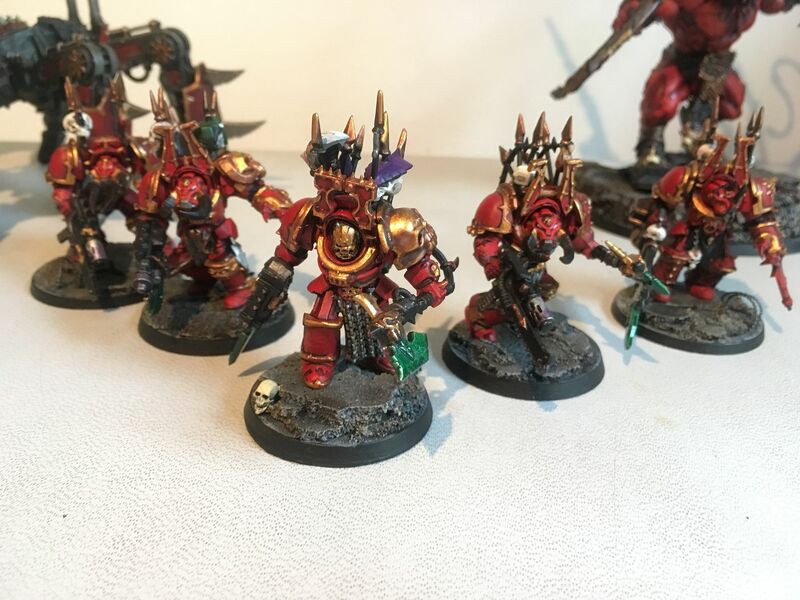 With the rest of the Bloodcrushers. Also started painting the Lords Jugger and reworked his armour a little. He's closer to paint now. Need to add his reins and finish painting the Jugger. Wow, it's been a while since I posted here. Let's have a quick catch up of what I've been up to. 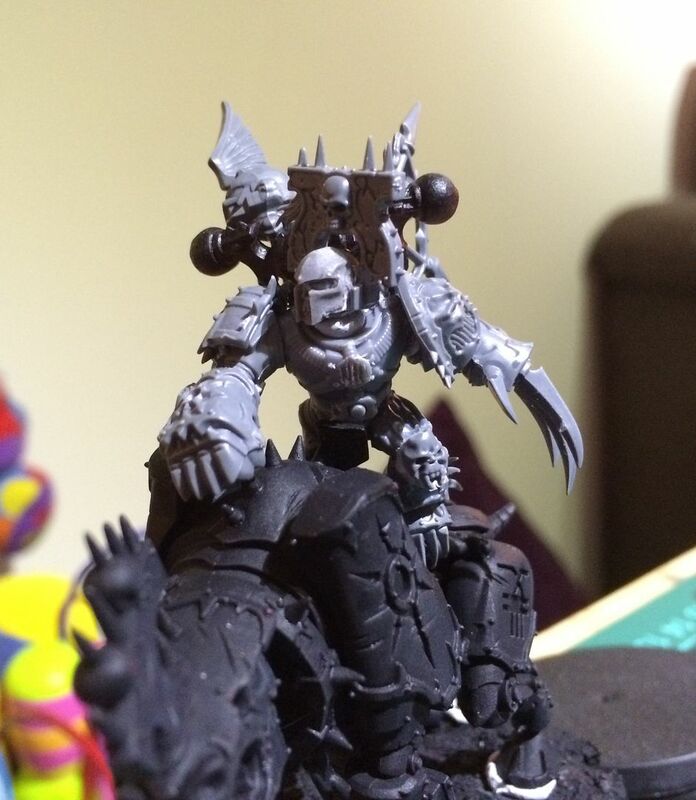 First off, I built another Lord to ride on the Jugger. 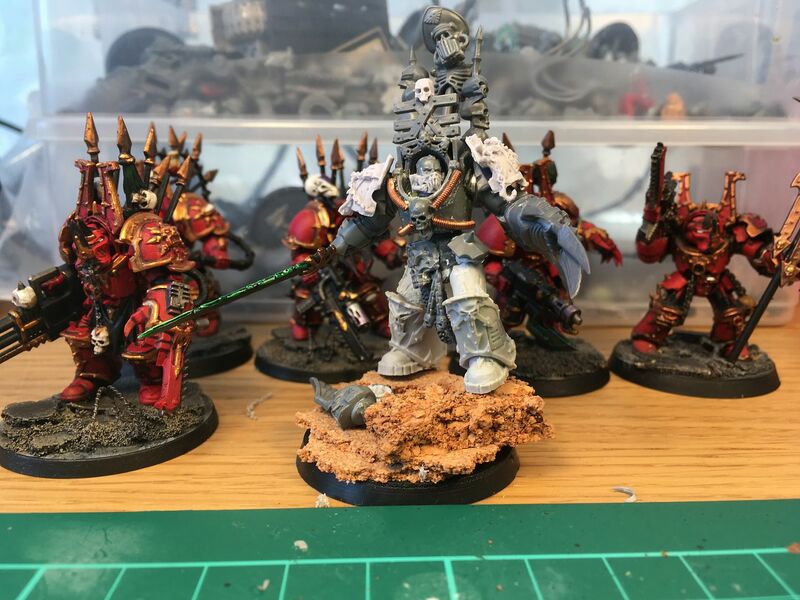 The fist/claw guy is still only base coated. 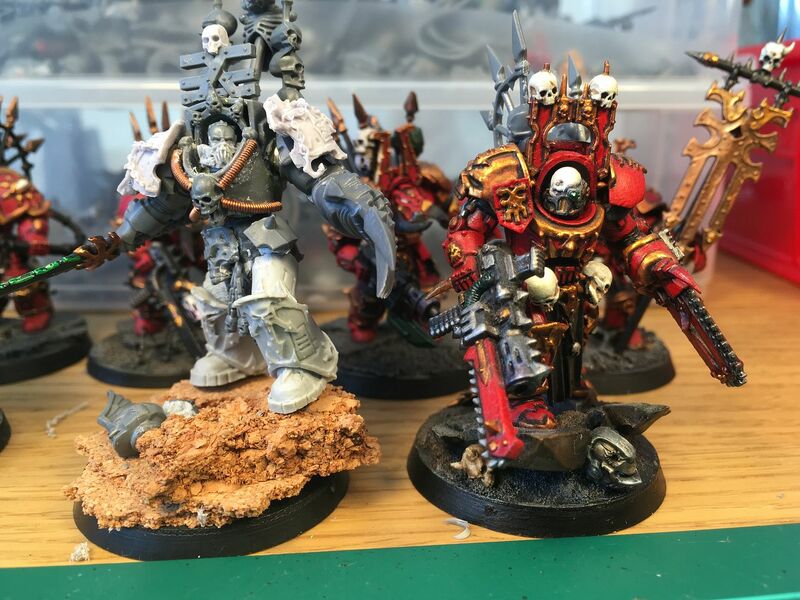 The reason is I discovered how good the Axe of Khorne is. I also started painting another Herald. From a building viewpoint I've started building a new version of my Lord Malek Deimos. 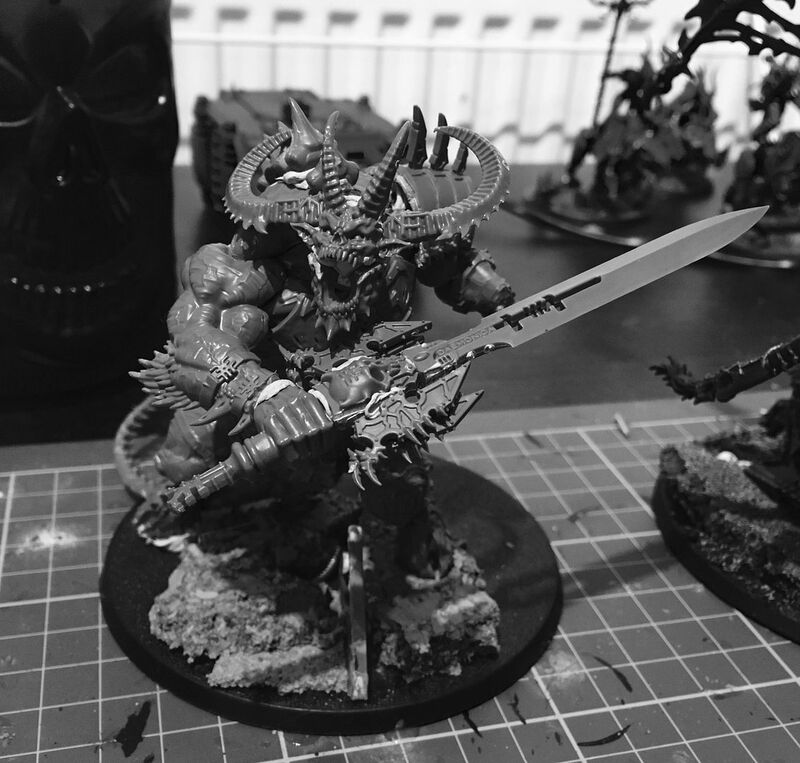 I've magnetised him so if I wish I can run him as a version of Abbadon or Zhufor or just a generic chaos Lord. I also built a Jump pack Lord for a guy at my club. I still have more pics to share but I'll leave these here for now. Thanks as always buddy. It has been too long. 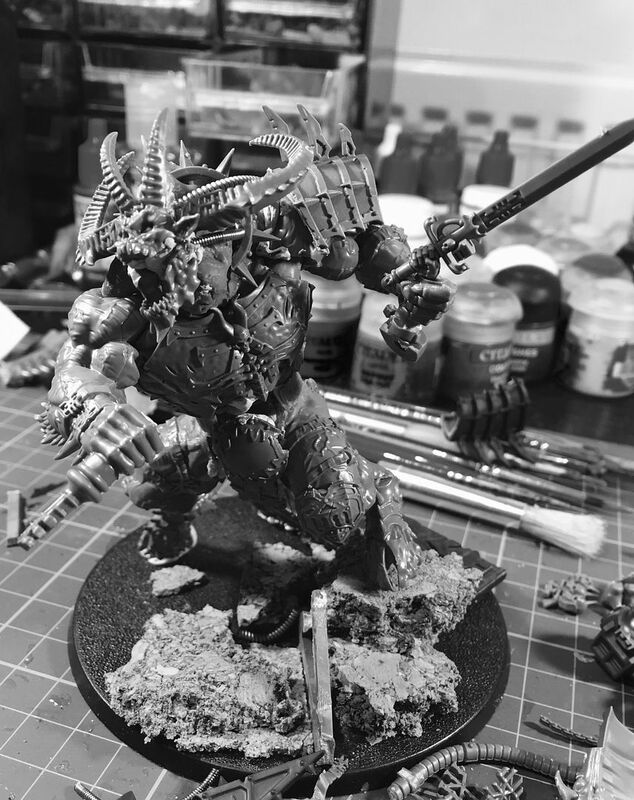 I have another WIP that was very much inspired by Krautscuentists Angron build. 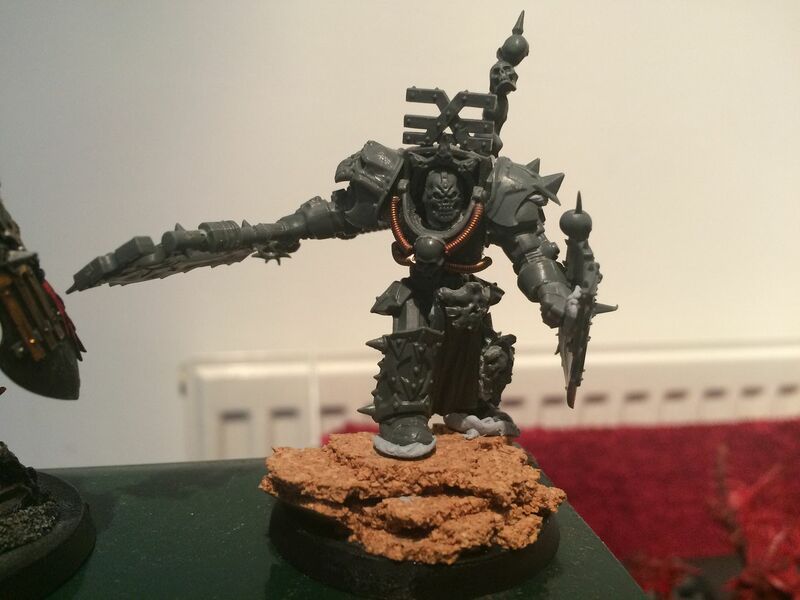 I saw what he was doing and decided to blatantly steal the idea and add my own spin on things so I came up with a more armoured version of the Lord of the Red Sands. Bear in mind these pics were taken very early in the conversion. I need to dig him out and work on him some more and update with better pics. 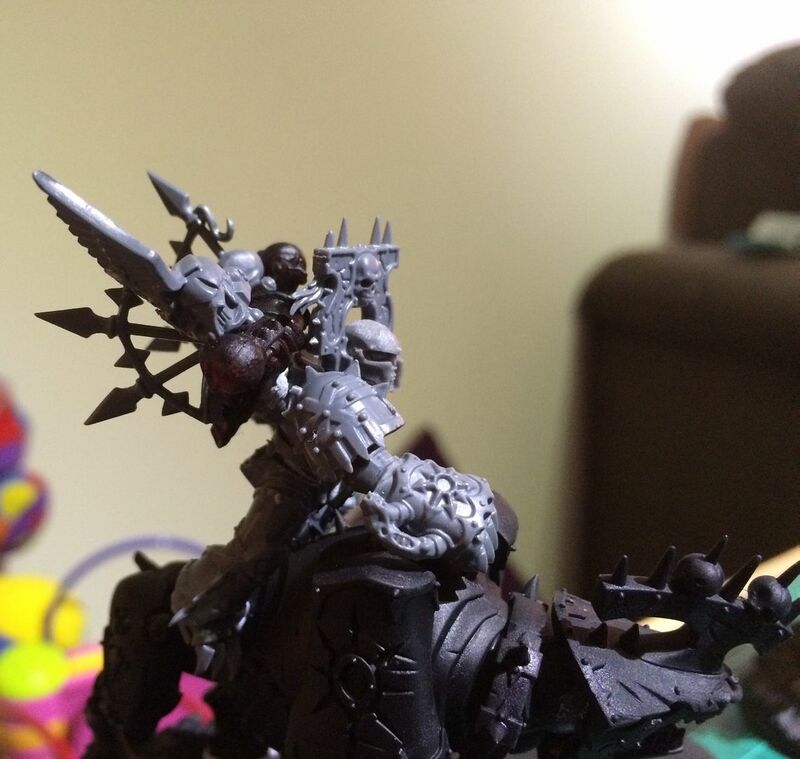 Add leather straps to his shoulders similar to the FW model. Appart from that rambling, great mini, very nicely made and imposing. Another long break between updates. I really need to remember about this log and stop neglecting it. I have a couple of small paint updates. First up is a small force Id painted for a double tournament in June. 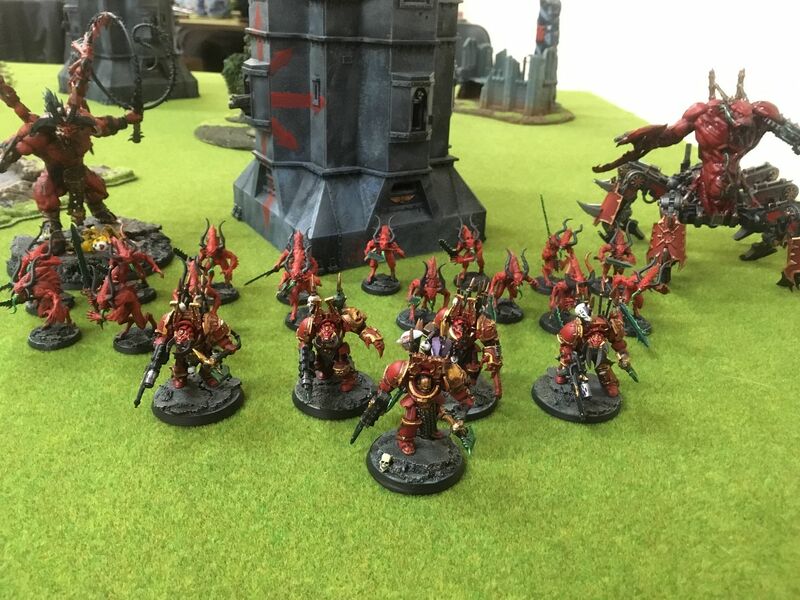 It was 800pts a player, my partner took a Tau army and I used my KDK. My list pretty much all died by turn 3. Meh. 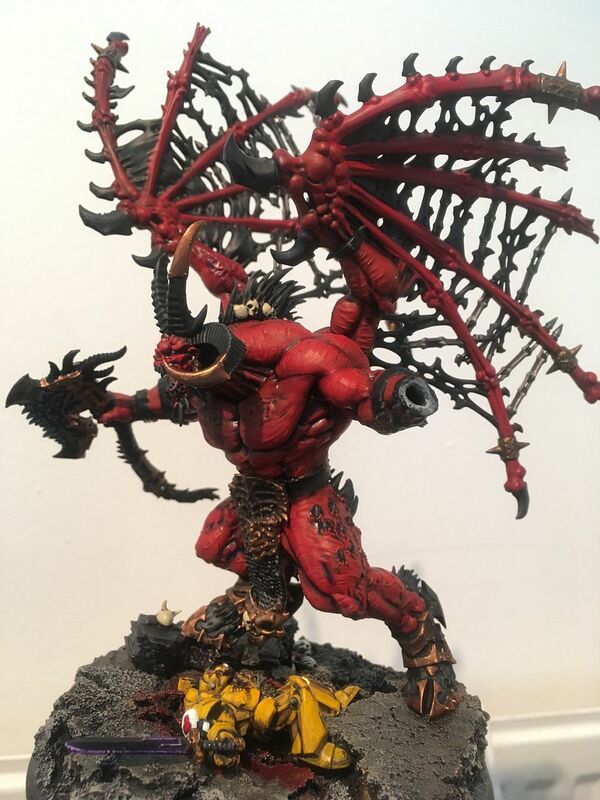 Finally got around to painting my Skarbrand model. 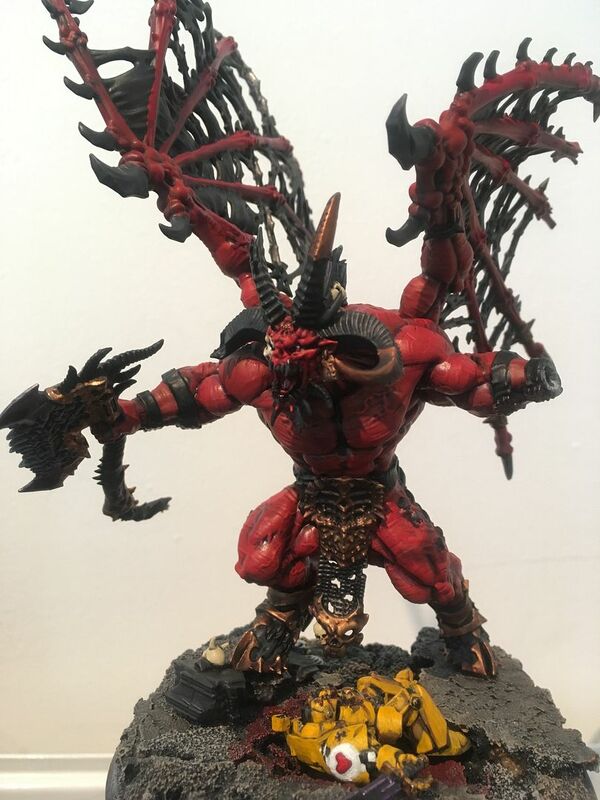 I magnetised his left arm to hold a whip and used him as Bloodthirster of Unfettered Fury. Don't have any proper pics of him close up. I will get some soon hopefully. 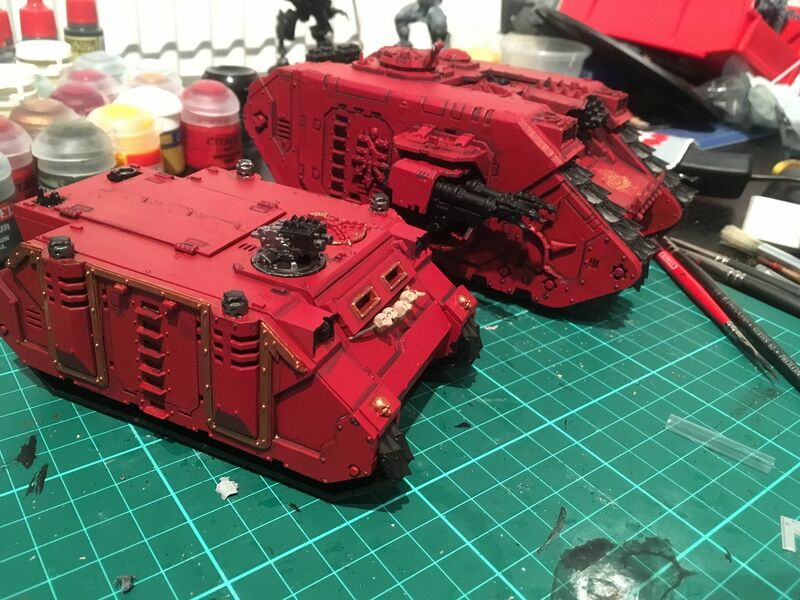 Also started painting a Landraider and Rhino finally. 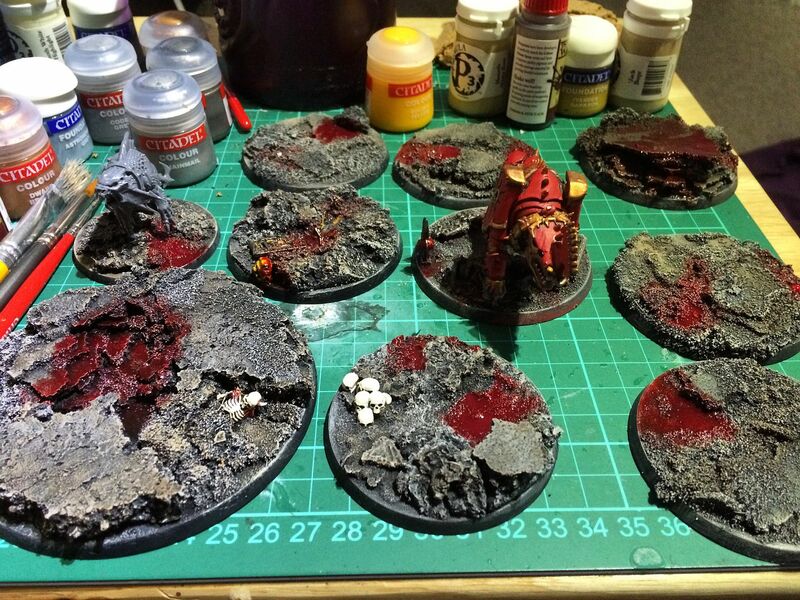 These have been base coated for years. Again, these are further along than the pics show but I don't have any new ones yet. Legio Ultra, I did as Kraut before I borrowed this idea it's all good. As for this update. I'd had this guy planned for a while but again it took Kraut to push me to finally do some work on him. 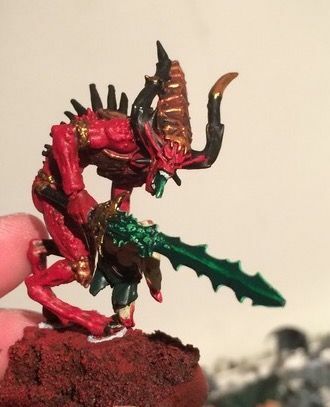 Here's the early WIP of my Daemonic Angron. 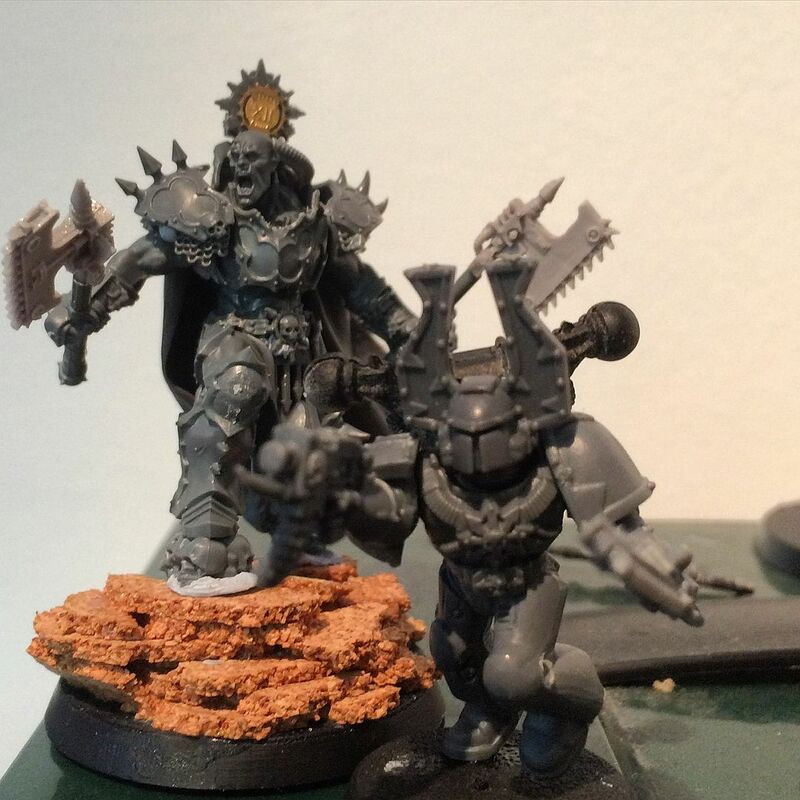 I'm basing him on the old Epic model. 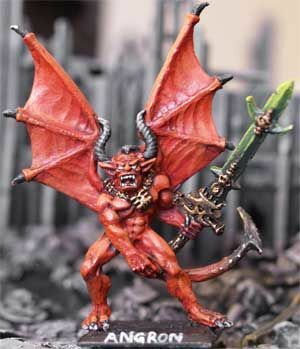 I always love the classic devil look that model had. Here's a look to show those who don't know or remember him. This isn't my model but it's decent version of him. 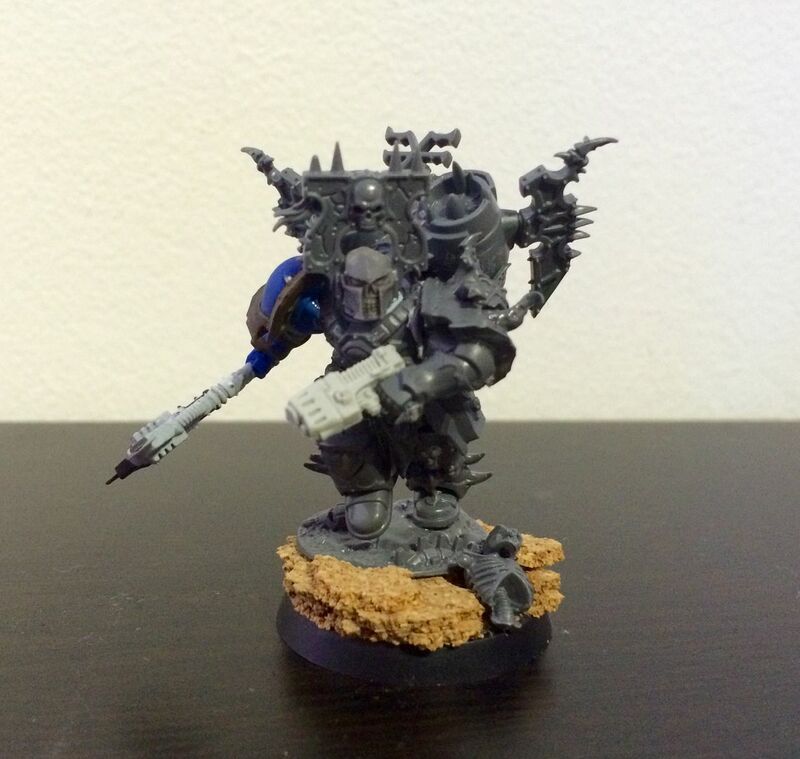 He'll possibly be holding a dead/dying Grey Knight terminator in his left hand. Here's what I have for his Black Blade so far as well. This is the bit I'm really wanting to work on. 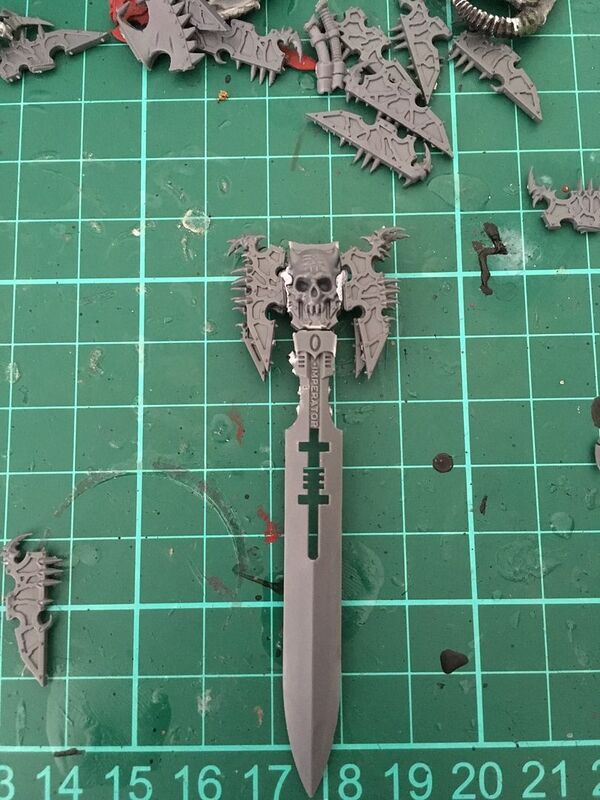 All the Inq symbols will be removed obviously but I thought there was a delicious irony in using a Grey Knight blade. 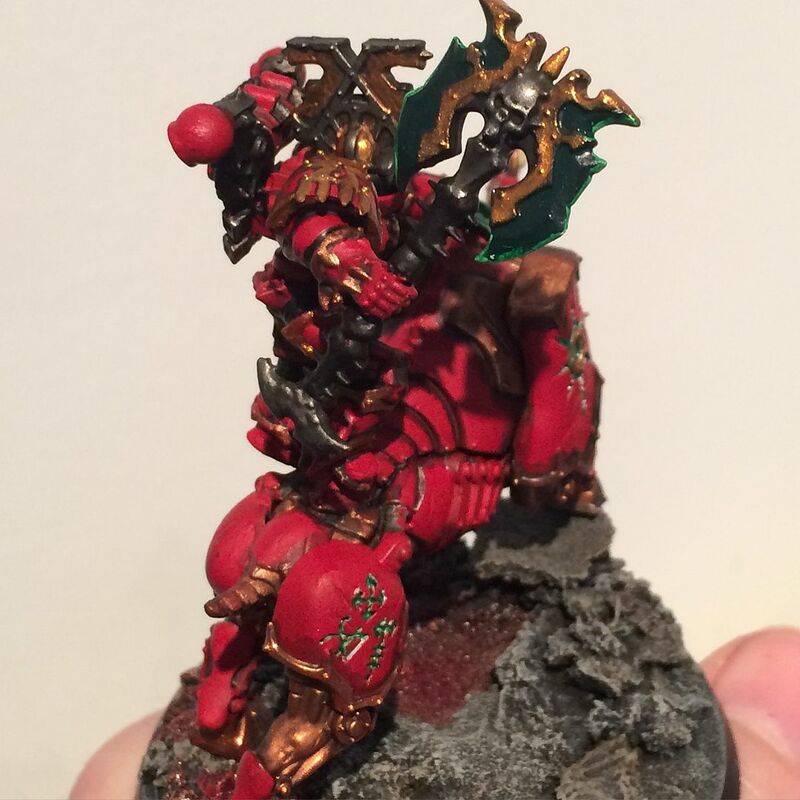 I want to extend the hilt of the sword so ignore the Khorne symbol for now. Again though it's all packed away but I just want to work on it. 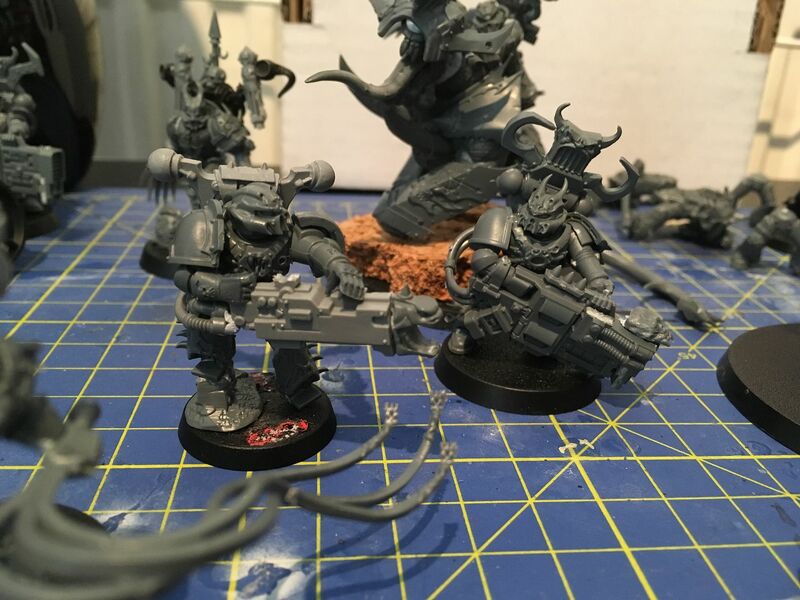 I have another project I'll be working on soon as well in relation to the Call of Chaos over on the Bolter and Chainsword. 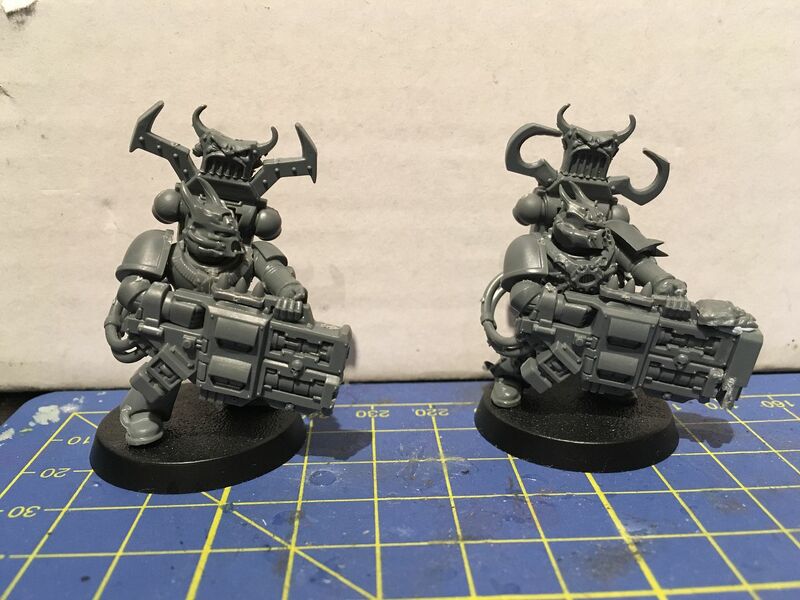 It will be a Slaanesh Chaos marines force. 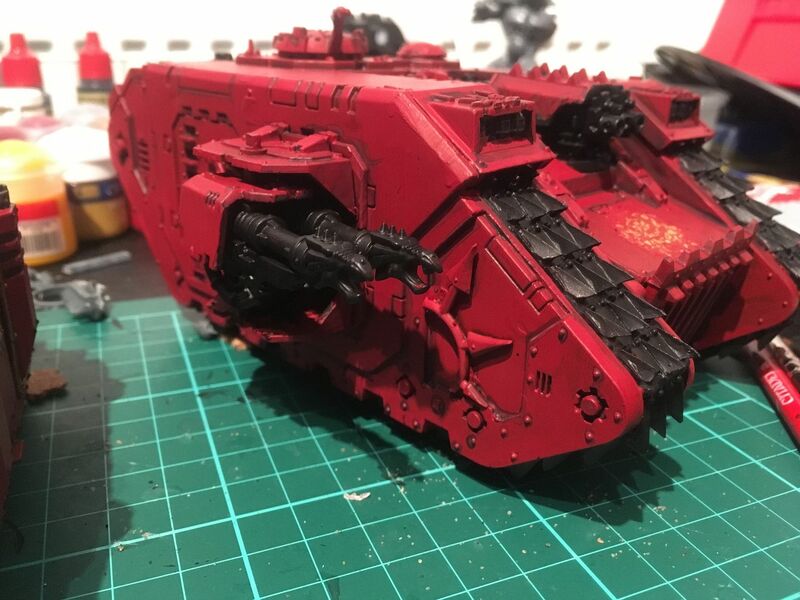 Only have a couple of pieces built, I've made a couple of custom Blastmasters and started to work on a Sonic Dread conversion as well. 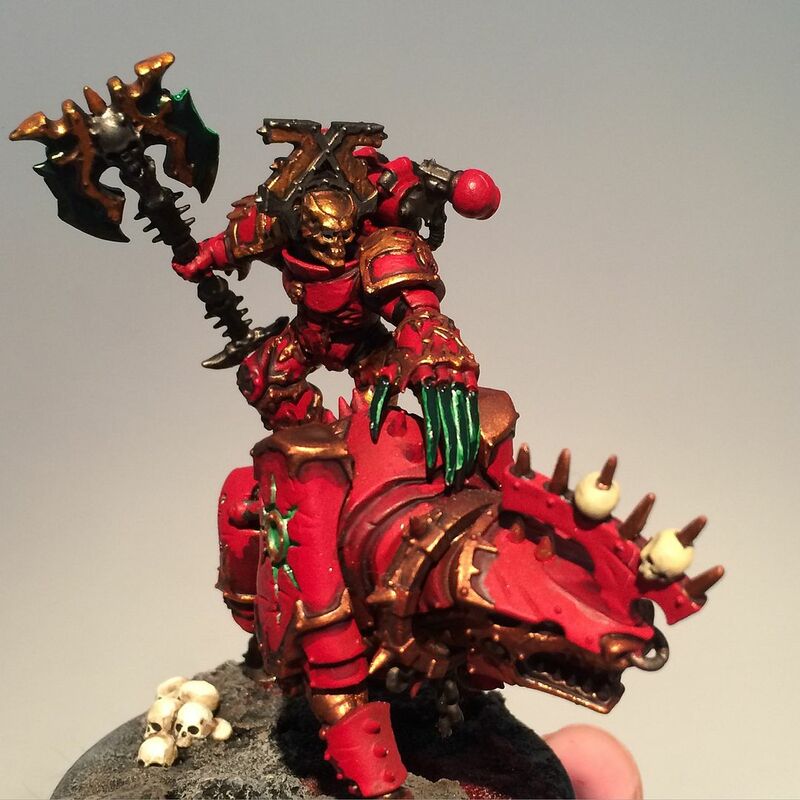 Again still very early WIP but I hope to have 2 squads of Noise Marines, 2 Sonic Dreads and a Lord on either a bike or steed. 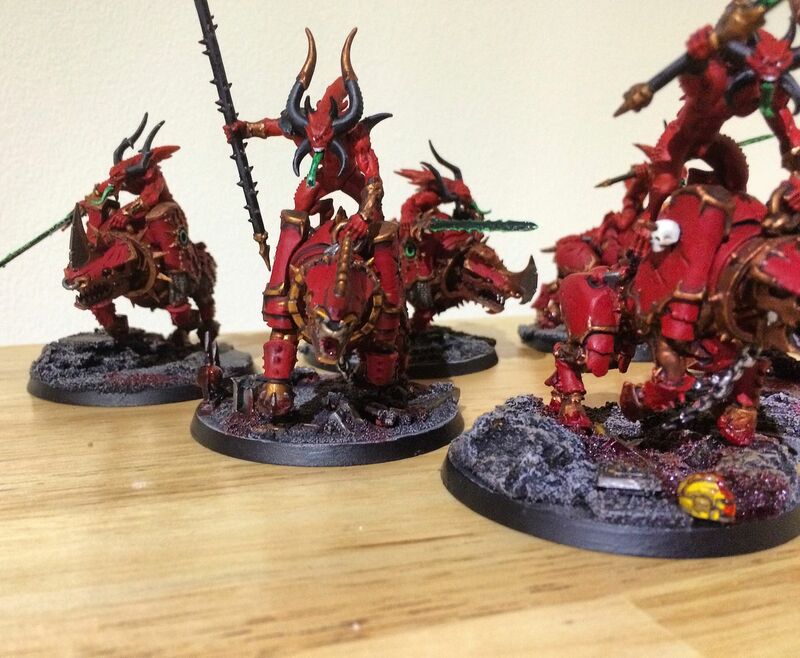 I have some daemonettes to run alongside them as well. Like I say I'll have all these built by the time the Call starts. As always let know what you folks think. Haha brilliant. Hopefully it won't be too long till I have more to show. I'm keen to work on the Dread a bit more and refine what I've done with the Noise marines as well. These were built with limited access to my bits box so I'll have a few more details to add to them asap. So no more work to show on my Slaanesh guys yet. Had a bit of a nightmare house move but starting to get settled now. I've been messing about with a couple of bits and pieces over the past week when I've had time. 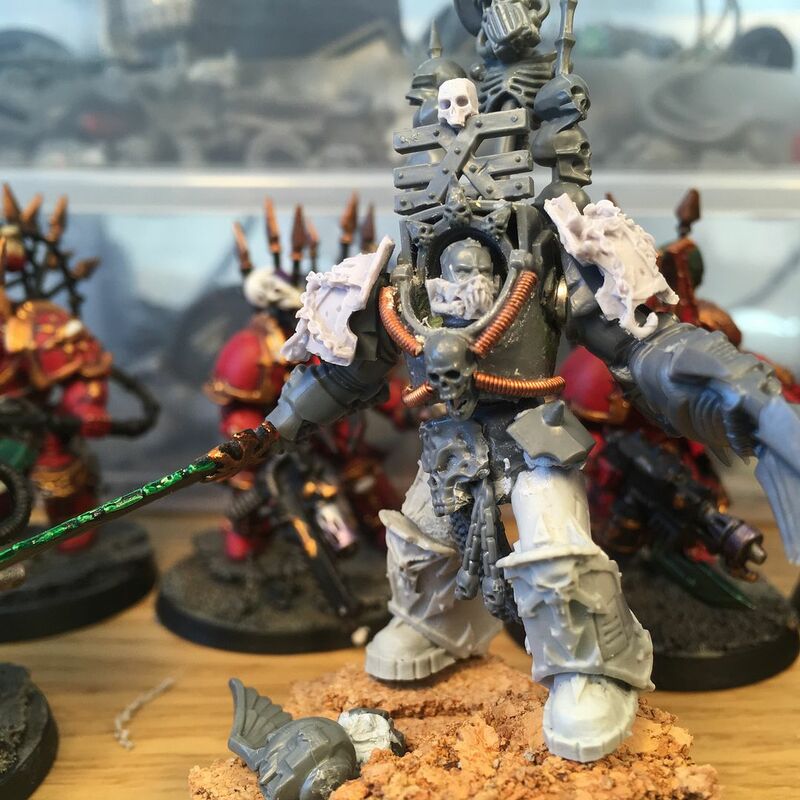 I've very nearly finished another build of my Lord Malek Deimos. 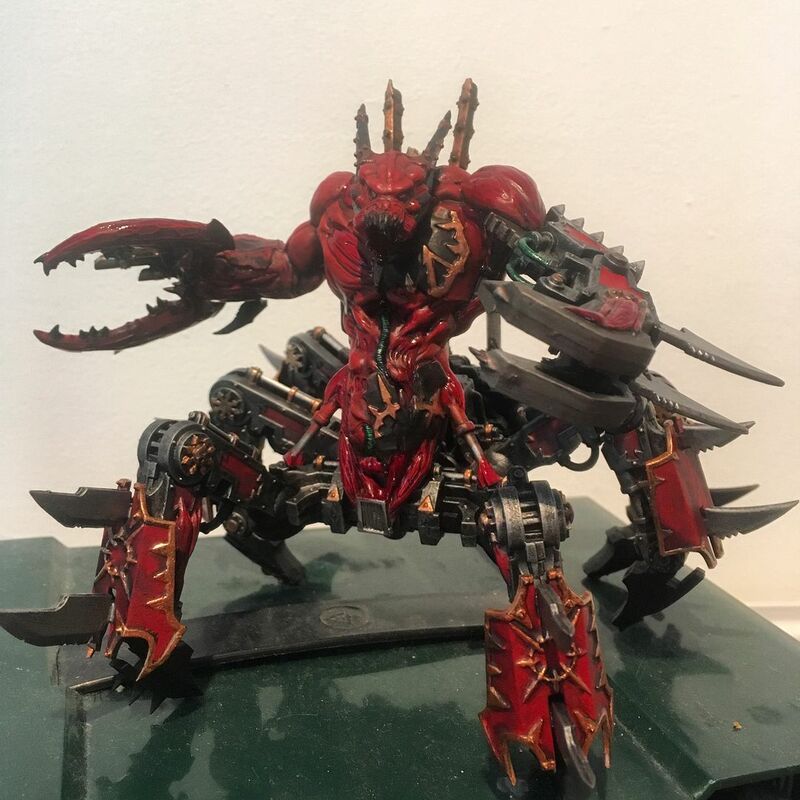 His first complete version (actually probably about his 5th build) I felt like I kind of rushed the paint and I was never convinced he was brutal or imposing enough. So I rebuilt him slightly. 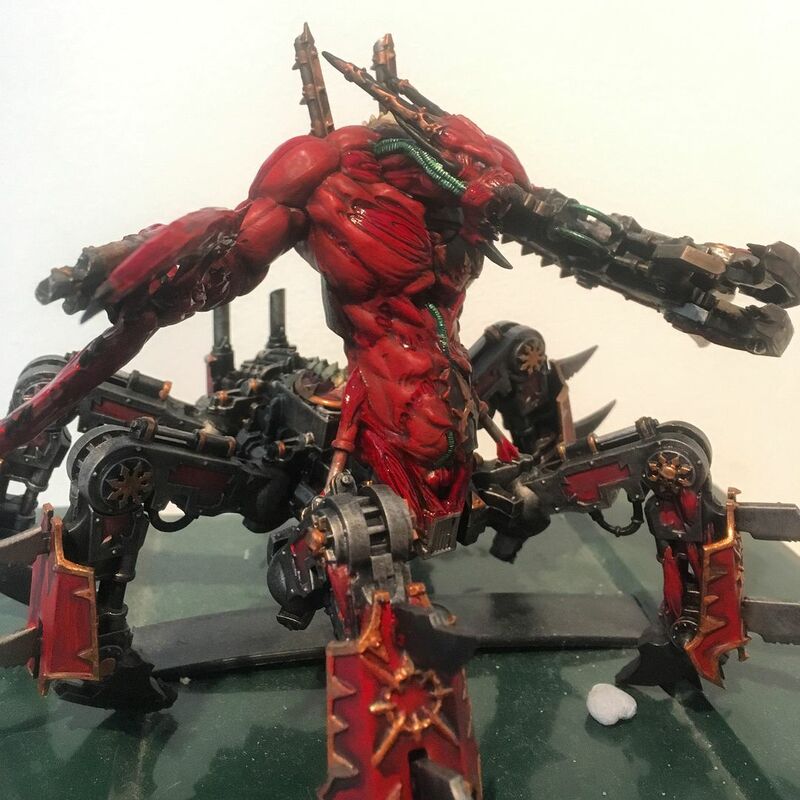 I felt this was a bit more brutal looking now, I also took the opportunity to magnetise his arms so I could switch his load out. 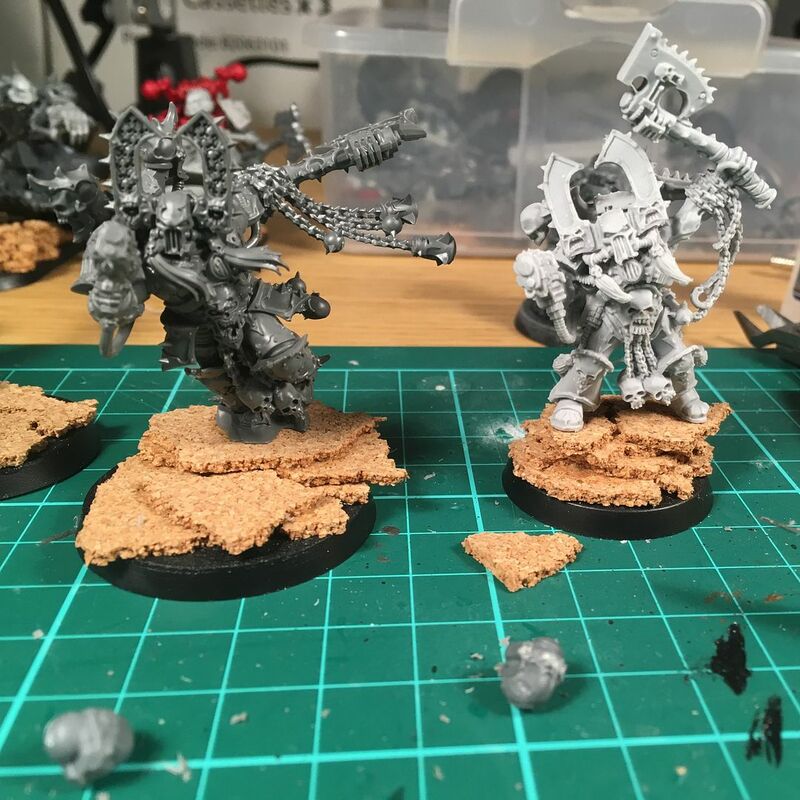 Still though I wasn't satisfied so I managed to acquire a set of Finecast Obliterators via FB and set about butchering the legs of one of them. 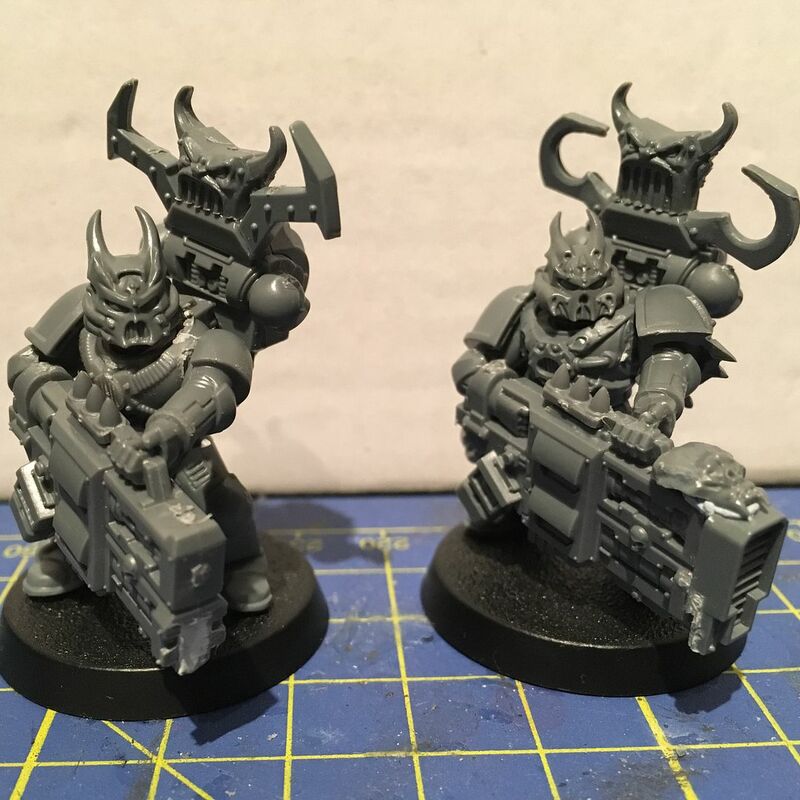 I also picked up some of the Terror Squads helmets from FW. For Maleks head/mask I took one of the NL heads, snipped the top off it and used my dremel to hollow out the inside of the helmet. 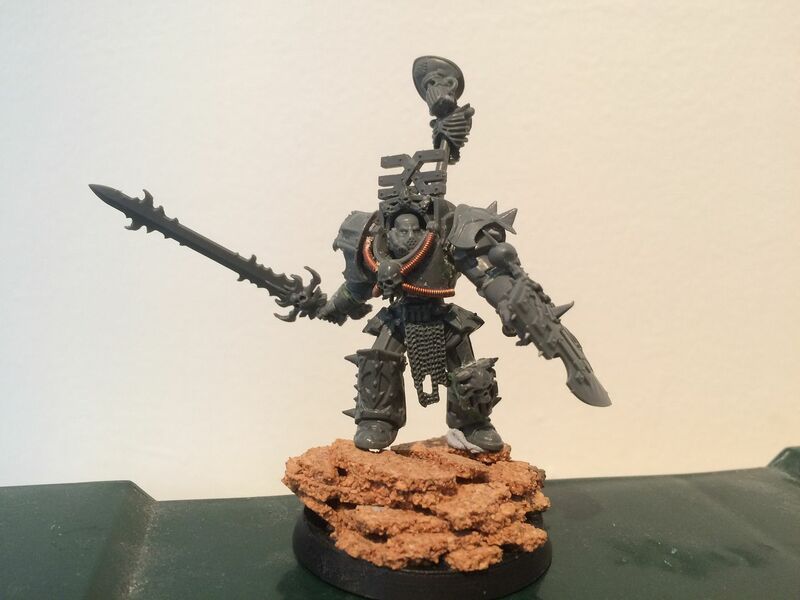 I then took the librarians head from the Deathwatch Overkill box and slotted it into the hollow of the helmet. I had to trim a bit from the bottom of the head and it still needs a bit of gs but here's where it's at just now. And here's a couple of scale pics. I picked up my copy of Traitors Hate and I'm loving the fluff and a few of the formations will let me field my World Eaters again. Especially the Terminator Annihilation force and Raptor Talon. I also got myself the Bloody Eighth as well. 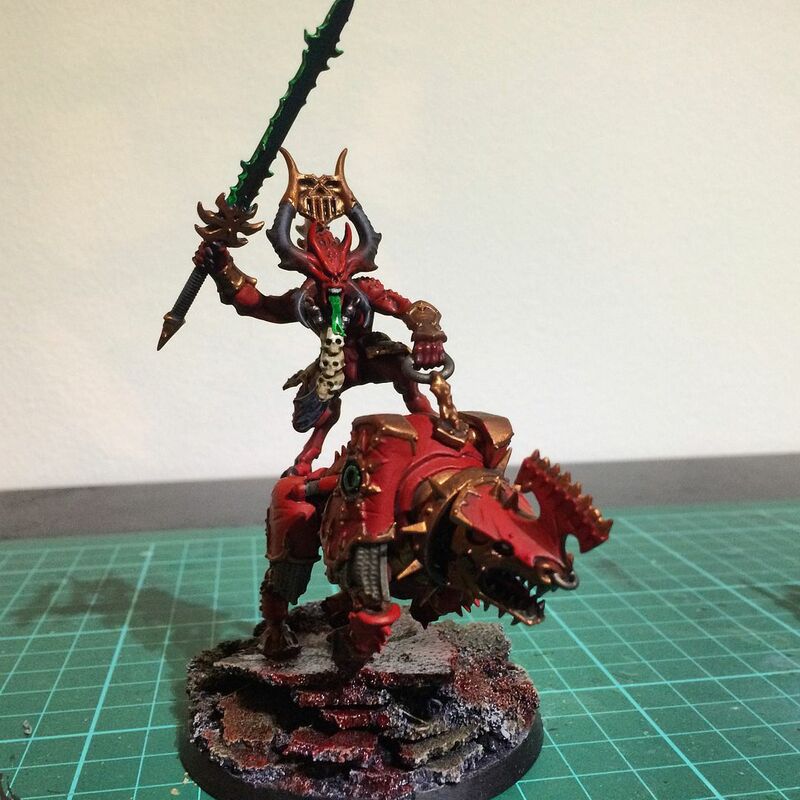 I used to have the old metal Kharn but cannot find him for the life of me so I picked up the old version in Finecast as well before he goes OOP. Over on the B&C the Call of Chaos starts tomorrow so I should have more updates very soon. 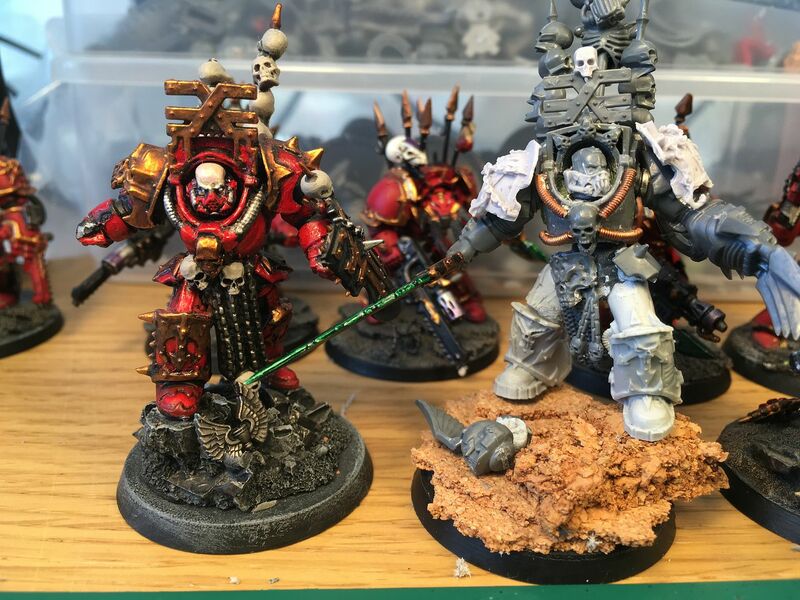 Wow.... Kharn is... a lot bigger! 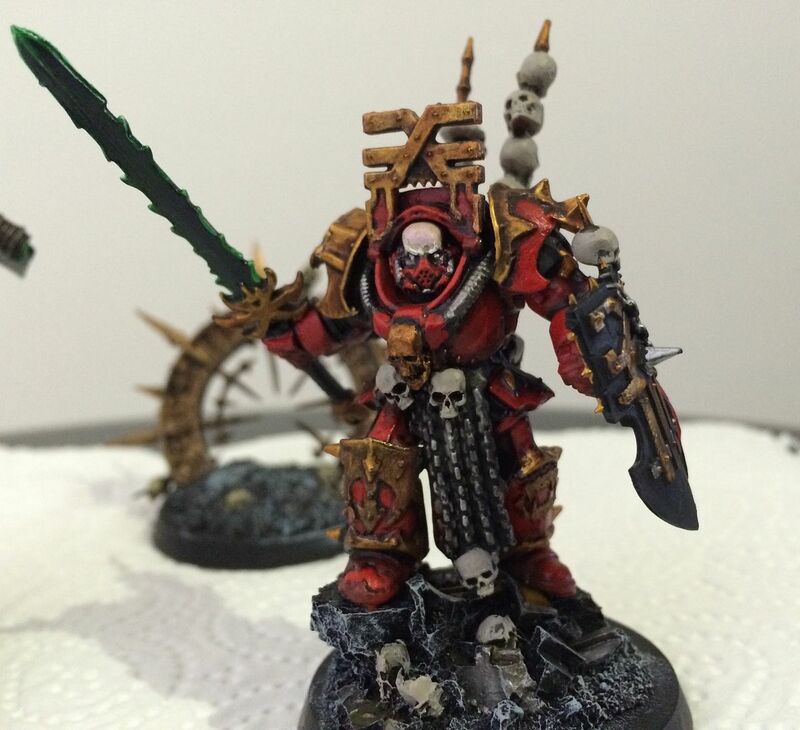 I feel like Kharne HAS to smash the blood angels - he's KHARNE! This crusade should be the one that works. 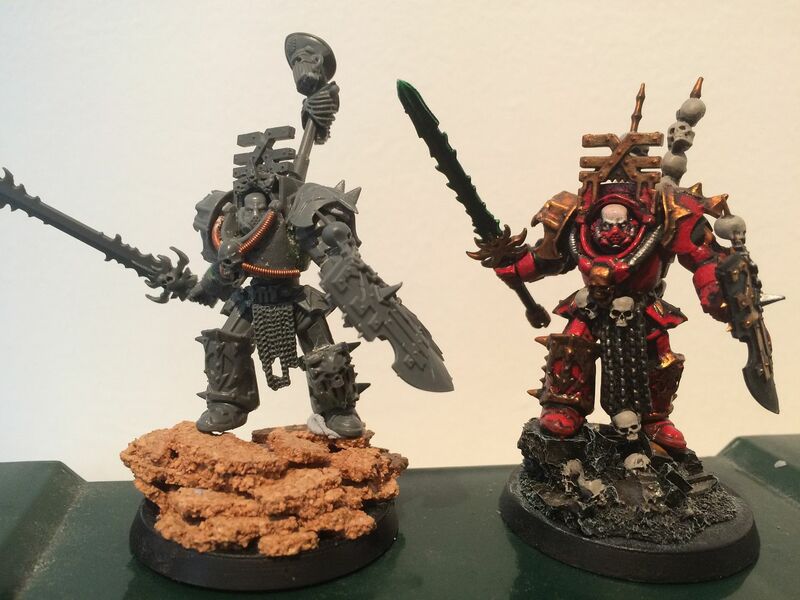 Appreciate the comparison photo, the new model is a beast next to the classic mini. Your new lord is looking awesome. 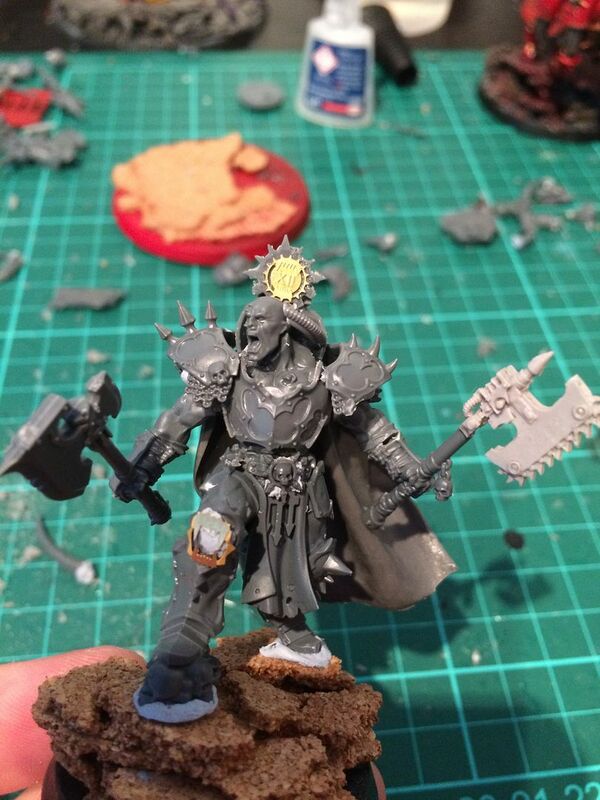 New Kharne looks badass too, the new mini is truly excellent, can't wait to see some paint on these dudes. Your new Malek is great, very nice use of the NL terror squad's helmets there. 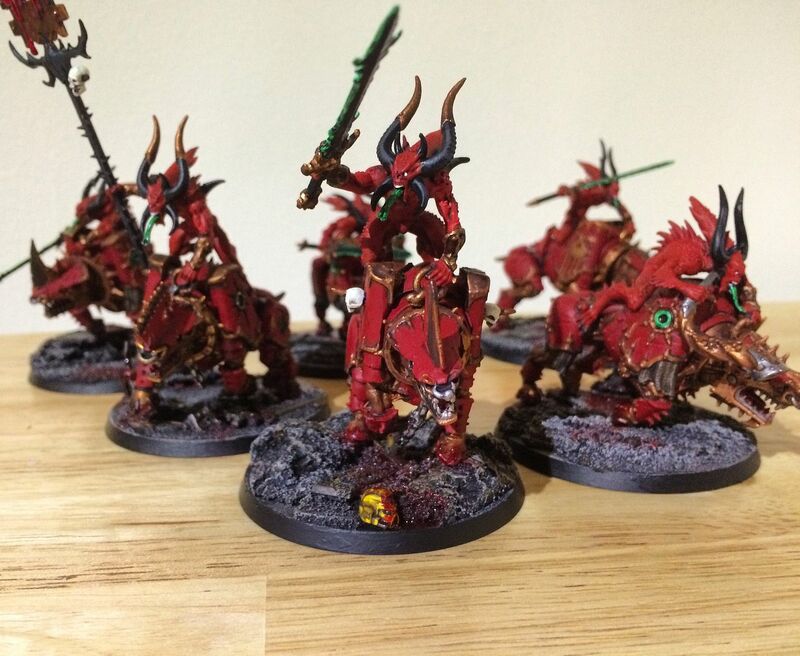 And the new Khârn looks good as well, thanks for the comparison pics next to the old one.